Accused of an academic integrity violation? Get your student handbook. 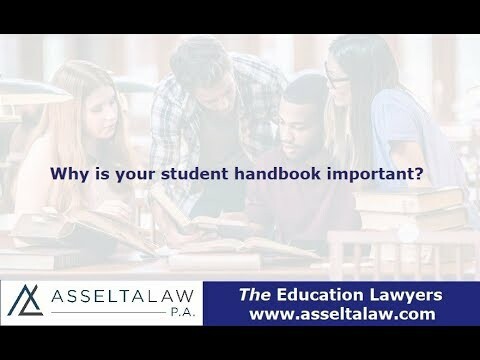 Why is it important for students facing an academic integrity charge to know their student handbook? When a student is facing an accusation like cheating, plagiarism, or other honor code violation, the handbook contains the procedures the student will face. Will my college tell me what the procedure is if I am accused of a disciplinary violation? A student should never rely on the university to tell them what to do. It is not that they will purposely mislead a student, but I have worked with several students whose own university does not follow their policies. If a school is not following their policies, things can quickly turn against the student. Where should I look in my student handbook? The most important section is about the disciplinary process. Try searching keywords like: academic misconduct, honor code, or disciplinary procedure. If you can't find it, ask the university to direct you to the policies they will be following. What should I pay attention to when reading the disciplinary procedures? • Look for the definitions of the honor code violations you are accused of. • Make sure the school gave you proper notice of the academic violation. • Pay attention to the procedures for submitting your defense evidence and obtaining the evidence being used against you in an academic or disciplinary hearing. • Highlight the student hearing section and make a special note of the rules of the hearing. Can you bring a lawyer or an adviser to help you during the hearing? • Check what your appeal rights are if you lose the academic integrity hearing. Can you help me defend against an honor code violation? Yes. I help students all over the country defend against accusations of academic integrity violations. Using nearly two decades of legal experience combined with a specialized knowledge of the student disciplinary process, I help students gain successful outcomes. I must go in front of an academic integrity committee. Can you go with me? Yes. I also attend hearings as an adviser to support students during the committee hearing process. The presence of an adviser with my background supports the students to make the best possible presentation and keeps the academic panel hearing fair.